The good news from Changelly and Enjin don’t stop with the launch of Changelly branded version of EnjinX explorer. 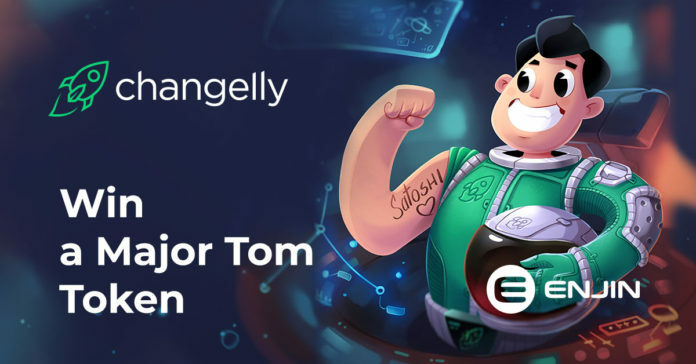 To celebrate this new collaboration of the two companies Changelly is offering our beloved users to take part in a new giveaway and win an amazing prize – “Major Tom” token which is playable in 22 blockchain games! Major Tom is a collectible token based on Ethereum ERC-1155 assets, which distinctive feature is that they are interoperable with any other blockchain games and applications. Hence, ERC-1155 enables any app to access the data required to support Ethereum’s entire inventory of Major Tom tokens. Major Tom will be supported by many highly-anticipated blockchain games including War of Crypto, Age of Rust, Bitcoin Hodler, Rebounce, Cats in Mechs, and Alterverse—which contains a network of 17 different games. This means the giveaway participants will be able to use their Major Tom tokens within 22 different gaming worlds, once the games go live. This limited edition Major Tom token will have 10,000 supply and be backed by 1 ENJ. Every participant that completes 10 or more giveaway actions described via the link will receive the Major Tom token. Entries will be accepted from 8:00AM AEDT 2019-03-19 to 8:00AM AEDT 2019-03-26. To receive your prize, you must download the Enjin Wallet, which will enable you to safely store your blockchain gaming assets. Get it now on the App Store and Google Play. The fastest astronaut in the crypto universe from the Changelly space team. Major Tom has more than 3 years of everyday crypto-to-crypto exchange experience. As a genuine explorer, Major Tom personally landed on over 140 star-coins and tokens, and he keeps discovering the crypto universe, infinitely driven by Satoshi’s revolutionary ideas. What about his superpower? He is awake 24/7, ready to guide you through the maze of crypto galaxies. How to set up a XRP wallet?